It is important that you know how to care for your car. Proper vehicle maintenance can keep it in good condition throughout the school year and beyond. Ideally, you will have it inspected prior to returning to school if you study in another city or state. You should also make sure that the tires are rotated and the oil is changed. Furthermore, be sure that you have enough windshield wiper fluid to get through the rainy and snowy fall and early winter weather. Finally, it is a good idea to have your car checked for rust or other signs of damage so that they can be taken care of before they grow into major issues. If your vehicle needs to be serviced, bring it to Kia of West Nyack. 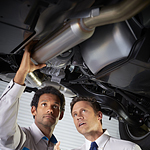 A trained service technician can handle all of a vehicle's routine maintenance needs in a timely and professional manner.